Please bear in mind that finished crossovers are always inferior to crossover kits since they don't consider the particular properties of the drivers and the cabinet. Therefore, a reasonably priced kit with matching crossover components is always superior to Seas Exel and ScanSpeak drivers with standard crossovers. Nevertheless, we have some finished crossovers available (even more upon request). 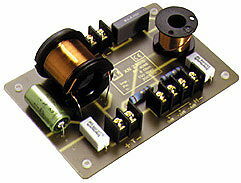 IT 2 way crossover for 8 Ohm drivers with 2000 Hz cut-off frequency, 12 dB/oct. and 150 Watt power handling. The crossover has 2 gold plated terminals each for connection to the amplifier, tweeter and woofer. There are two additional connectors for reducing the volume to the tweeter by 3 or 6 dB. Dimensions: 145 x 100 x 52 mm. IT 3 way crossover, like XN320 ... XN 330, however, for two woofers at 8 Ohm or one woofer at 4 Ohm. The crossover frequencies are 400 and 4500 Hz; dimensions: 175 x 120 x 68 mm. IT crossover to extend your loudspeaker by two subwoofers (or two woofers or a driver with two voice coils). An additional amplifier is not needed. Power handling is 120/180 Watt, impedance 4 Ohm, cut-off frequency 90 Hz, 12 dB/oct., dimensions 150 x 90 50 mm. This crossover is equipped with high quality coils. *) Right above and below are two additional connectors each for reducing the output to the loudspeakers (coax/ satellites). The volume of these speakers can be reduced by 3 dB or 6 dB to ensure that subwoofer and satellites/coax speakers are equally loud.